A page is what your visitors will see when they go to one of your page's URLs. A page can belong to only one collection. When a page is visited the associated data is recorded for the page and its collection. You can use this segmentation to determine how pages in your collection are performing. Every page you create is visible to all users within your workspace. Every page starts from a page template. All pages are created using a Page Template. The initial structure for your page's content is determined by the page template you select. There are two types of page templates: stock page templates and custom page templates. At the top of the modal you can switch between the "Stock" and your "Custom" templates. Stock Page Templates: templates that we, at Landing Lion, have created for you. Custom Page Templates: templates you or users within your Workspace have created. To see a preview of the template, hover over the template and click "Preview." Find and select the template you want to use; then click "Use This Template." All new pages are named "Untitled" by default. The page name is used to identify your page and to create a default page slug used to build your page's URL. On the top left of the Main Pane, there is an ellipsis icon next to the page name. Click the ellipsis icon to reveal the page's actions. Click "Rename" on the dropdown to assign a name to your page. You will be prompted to name your page before you publish or save it for later. 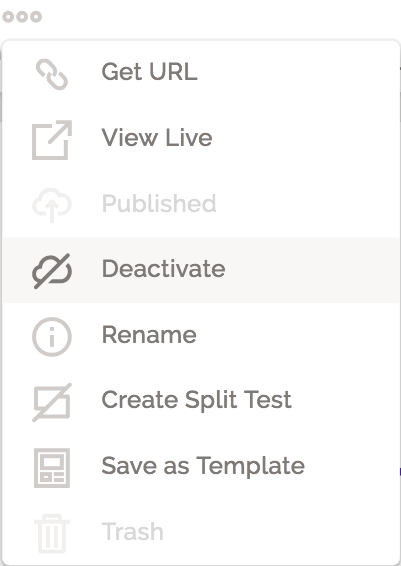 You can view your published page, rename it and more with page actions. On the top left of the Main Pane, there is an ellipsis icon next to the page name. Click the ellipsis icon to reveal the page's actions. Publish - Makes your page live on your domain and visible on the internet. 💡 Don't stress if you accidentally trash the wrong page. Click on the popup notification at the top right of the screen to restore it.